Black Panther Mark Clark and Comrades Deserve Apology From His Hometown Newspaper Peoria Journal Star. After 46 Years, Their Lives Still Matter. The racially charged December 10, 1969 editorial of the Peoria Journal Star that describes Black Panther leaders and members as "ex-convicts, jobless, and not overly bright." In our continuing discussion over police tactics used to control and often oppress minority communities throughout the nation, more than a few law enforcement and conservative voices have dragged out the wretched old canard of linking the former Black Panther Party to the Ku Klux Klan. However, no serious commentator with an ounce of historical understanding compares the former revolutionary socialist self-defense force Black Panther Party to the racist American domestic terror organization Ku Klux Klan. Unfortunately the Peoria Journal Star daily newspaper did just that on its editorial pages back in 1969 in the wake of the police murders of Peoria BPP founder/leader Mark Clark and Illinois BPP Chairman Fred Hampton in Chicago. The paper has yet to atone for these and other related racially charged transgressions. 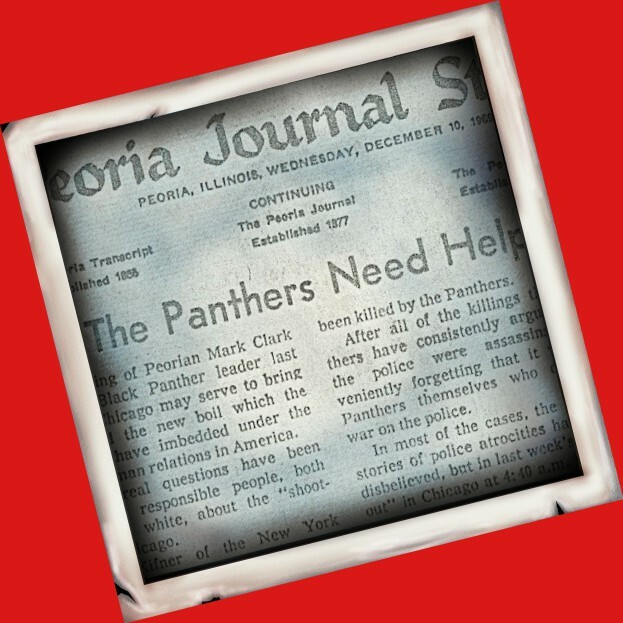 "Hate coupled with intimidation and demagoguery made the Panthers into a sort of a black Ku Klux Klan," wrote the Journal Star. "The white sheet was replaced with the black beret and jacket." Apparently hate, intimidation and demagoguery somehow became the equals of murder, lynching, bombers, and torture targeting innocent men, women and children of color. Who knew? And it was finally put together under the Panther label by a coterie of articulate ex-convicts and jobless civil rights activists who duped a few young men who were not overly bright to sell their newspapers and play the cannon-fodder roles of tough-guy revolutionaries. The Journal Star made it crystal clear to its overwhelmingly white readership that Mark Clark and his Black Panther Party African-American colleagues were nothing but their worst imaginings of the black males among them. The December 10, 1969 editorial thankfully stopped short of using the n-word, but the labels of ignorant jobless ex-cons for a group of black men (nothing is mentioned about the BPP women) engaged in revolutionary political and civil tactics pretty much tell the reader then and now all they need to know about the overt racism and paternalistic attitude of Peoria's paper of record. The editorial was shockingly titled "The Panthers Need Help." Mark Clark was only 22 when he was shot down by Chicago police authorities in an infamous December 4, 1969 pre-dawn raid on a Panther apartment targeting Illinois BPP leader Fred Hampton, who was only 21. Hampton and his colleagues were betrayed by a fellow Panther who provided the police with a layout of the apartment, and who managed to drug Hampton that night. Hampton was shot point blank in the head as he lay on his mattress. Clark was killed in a chair holding a shotgun apparently on security detail and may have fired a shot. The flat was riddled by nearly a hundred police bullets and several other Panthers were shot and wounded. The one-sided carnage was so obvious that an observer described the scene as "nothing but a Northern lynching." Internationally renowned US intellectual Noam Chomsky has reportedly called the killing "the gravest domestic crime of the Nixon administration." No one was ever convicted in the case which reportedly became one of the longest and costliest civil lawsuits in federal court history. A $1.85M settlement in the early 1980's was split between the raid survivors, families of Hampton and Clark, and their lawyers. The police, in conjunction with the Cook County State's Attorney office, and federal authorities carrying out its then-secret COINTELPRO operations at the direction of the FBI's J. Edgar Hoover, were also attempting to assassinate Bobby Rush, the Illinois BPP Defense Minister and Hampton's second in command. Luckily he was elsewhere, and went on serve the people of Chicago and more. Rush is the current US Congressman from Illinois' 1st District, and the only person to ever defeat Barack Obama in a political campaign. On January 17, 2009, the Meridian Star printed an editorial "We honor and we apologize" that stated, in part, "There was a time when this newspaper - and many others across the south -- acted with gross neglect by largely ignoring the unfairness of segregated schools, buses, restaurants, washrooms, theaters and other public places. We did it through omission, by not recording for our readers many of the most important civil rights activities that happened in our midst, including protests and sit-ins. That was wrong. We should have loudly protested segregation and the efforts to block voter registration of black East Mississippians." According to the Associated Press, The Richmond Times-Dispatch stated in an editorial on July 16, 2009 that it played a central role in the "dreadful doctrine" of Massive Resistance -- a systematic campaign by Virginia's white political leaders to block school desegregation. The newspaper says that "the record fills us with regret." 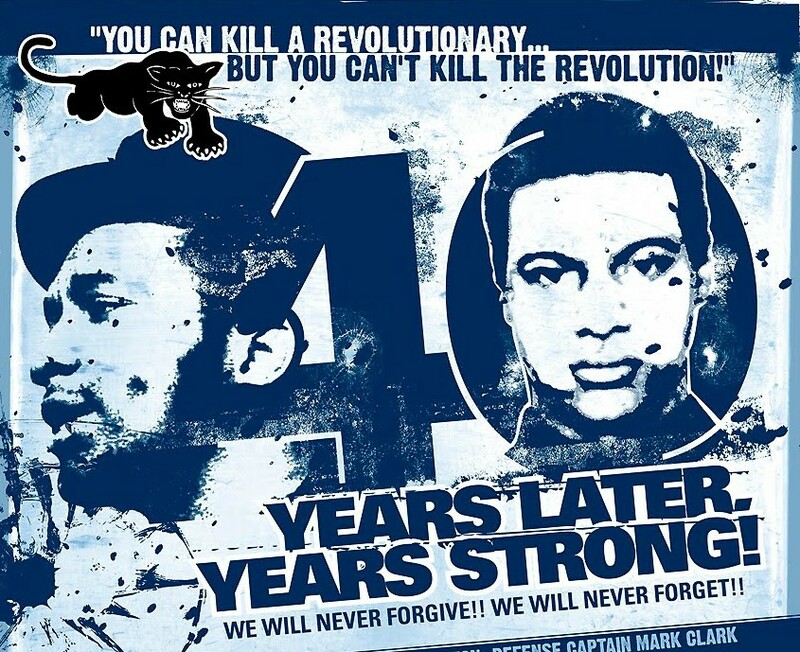 Fred Hampton (left) and Mark Clark are still remembered at home and abroad as martyrs to the cause of human rights. Racism and shoddy reporting (Clark was never identified in the editorial as the leader of the Peoria chapter of the Illinois BBP who had organized a free children's breakfast program at a local church) should never be tolerated at an American daily newspaper. Earlier this month, I was interviewed by a Journal Star reporter for a podcast in which I called out the paper for its coverage of Mark Clark. A native of Peoria myself, I even emailed the piece to its opinion editor and its publisher. So far, there's been no reaction or reply. A few years earlier, I called out the paper in a feature article complete with copies of the editorials in question. Again, there was no reaction by the paper.